Since visiting for the first time in 2011, I have been fascinated with the level of lean excellence at Rinnai. I recently had the pleasure to interview Mr Masao Kosugi, Director of Rinnai Corporation. Kosugi has been at Rinnai since they first started studying the Toyota Production System (TPS). Being a leading Japanese corporation, I am sure Rinnai were practicing a quite reasonable level of lean back in 1979. But a visit from Toyota’s Taiichi Ohno changed everything. Ohno was in front of many Rinnai employees when he directed his spray to management. However, then President Akito Naito realized that what Ohno had pointed out was quite accurate. From that moment Naito wanted Rinnai to seriously study the Toyota Production System. Many others thought the same after witnessing Ohno’s reaction, and they all agreed to begin the journey. Through kaizen and waste elimination they tackled and eliminated the issues in each of their processes one-by-one. “The result of this was that by the time we introduced kanban, the level of each one of our processes was quite high. So we did not experience any disruption when we finally introduced kanban and our new production system,” Kosugi said. There were some key characteristics in the way Rinnai spent those ten years studying TPS. Firstly, they had a clear plan of stages that they followed with discipline. Secondly, they involved all employees in improvement activities and production maintenance. Thirdly, they sent some of their own employees to Toyoda Gosei for 12 months to train in TPS. And finally, they would make regular visits to Aisin Seiki to learn the theory and shop floor application of their improvement efforts. The result is a spectacular example of lean excellence. Naito, now in his role as Chairman, still plays an pivotal role in driving this effort. The Oguchi plant was certainly the most popular factory visited on the Australian Industry Group Lean Japan Tour last November. On my first visit to Rinnai Corporation, they were surprisingly nervous. Official groups visiting the company had been very rare. They also knew that our Lean Japan Tour group was visiting the likes of Toyota, which is a benchmark for manufacturing in Japan and set up for mass numbers of tour groups. But the quality of the Rinnai tour was first-class, not only because of their genuine willingness to share their story, but also because of the level of lean that their shop floor exhibited. They expressed to me on numerous occasions that they are not as good as Toyota. They were right, they are better. I have found my new lean benchmark. Over the summer break, I read the autobiography of the Chairman of Rinnai, Mr Akito Naito. I was presented the book by one of his colleagues on a visit to Rinnai in 2011. I feel awkward referring to him by his first name here (as Japanese are referred to by their last name), but will do so for the sake of clarity. I first met Akito in 2010 through my role as Vice-President of the National Federation of Australia-Japan Societies. He was the President of the equivalent federation in Japan. However, it wasn’t until I visited his company that I truly became aware of the great things that he has achieved in his life. The company name Rinnai comes from the combined family names of the two founders, Kanekichi Hayashi and Hidejiro Naito (Akito’s father). The Chinese character for Hayashi can be read as Rin, forming the first half. The second half comes from the character making the first part of Naito. In the early days, Rinnai was a gas appliance company with only 50 employees. Today, Rinnai employs more than 10,000 people across the globe. Akito’s older brother was always destined to inherit the management of Rinnai from his father. Akito’s dream was to join a big company as an engineer and develop new technologies. He took a big step down this path by being accepted into Tokyo University – the most prestigious university in Japan. However, his older brother died in the war in 1943. Akito’s father asked him to forget his dream and join Rinnai. After graduating from Tokyo University in the spring of 1948, Akito started working for Rinnai. However, his father died later that year. Akito assumed the role of Vice-President with Hayashi as President. President Hayashi gave Akito much of the management responsibility. From the very beginning, Akito always had the vision of Rinnai becoming the world’s top gas appliance maker. Akito became President in 1966, and served in that position until 2000 when he became Chairman. Today, he still is actively involved in the company as Chairman at 87 years of age. In short, much of what Rinnai is today has been the making of Akito. 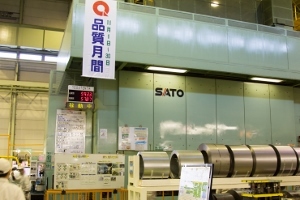 In his travels around the world and visits to many types of manufacturing operations, Akito found his own industry was very close to that of aircraft manufacturing. The point of similarity was that with both products, poor quality could result in the death of the user. Because of this, he made quality the cornerstone of his company and coined the phrase “quality is our destiny”, which is instilled right across the company. On our Lean Japan Tours, Akito has spoken to our group at length in English on both visits to Rinnai. Last year, he even joined us on the factory tour. He did not walk directly with us, but at his own pace and with his own intentions behind the group. I was acting as a marker at the back of the group and was able to watch his interactions around the plant. He had an aura of respect, but employees were comfortable in approaching him to discuss issues with him. Even at 87 years of age, he is still driving excellence in his organisation. However, on the 5S front, he is apparently running out of unsatisfactory areas to point out! You can understand why when you walk around his plant. It is the best example of 5S I have seen that spreads the entire site – including difficult to implement areas such as the press shop. It is an honour to have the opportunity to know Akito. For years to come, the company that he gave the vision to and built from a young age will be my lean benchmark of management excellence that I hope our Shinka Management clients will aspire to. Walking through factories in Japan, you can visually pick up on the concepts of lean being implemented. Reading through English books on lean, you can generally understand the concepts of lean being implemented. However, some of the essence of lean is hidden behind a veil of Japanese language, customs and culture. It is not generally visible to a foreign eye and not easily translated into a foreign language. I occasionally hear people say that lean does not work outside of Japan. I think this perception may be due to this veil. We need to understand lean at a deeper level and learn about its original intentions. A deeper level doesn’t necessarily equate to further complexity. Actually, it may equate to simplification. I have been dealing with Japanese in Japanese for over half my life now. If you have studied a foreign language, you know that some words translated into another language cannot always be done so with the full essence of its original meaning. I find that the Japanese concepts that lean is based upon do not always translate well into English. In fact, I believe that the English body of lean material is missing that essence. Take for example the word monodzukuri. If you look at the Japanese language websites of companies in Japan, such as Toyota, you often see this term. It is a common word used in industry. The English equivalent of the website translates this word consistently as “manufacturing”. However, the Japanese word has a much deeper meaning. Allow me to explain with a brief language lesson. The Japanese language is made up from three different character sets; hiragana, katakana and kanji. Hiragana is generally used for words of Japanese origin and katakana is generally used for words of foreign origin. Neither set have any meaning to their individual characters. Kanji is made up of thousands of characters that made their way from China to Japan. These individual characters have meaning. Now, break the word monodzukuri up into two halves; “mono” and “dzukuri”. Depending on the kanji you use for “mono”, it can have two separate meanings – thing or person. Depending on the kanji you use for “dzukuri”, it can have three separate meanings – build, create or make. The magic of this word starts to become apparent when you combine some of those sets of words: building things, creating things, making things, building people, creating people and making people. However, it is generally not written using any kanji, only hiragana and/or katakana, thus encompassing all of these words into one. And the more you read this word in context, the more you start to see that it can essentially be summarised into a simple phrase: the Japanese art of making things. Can you see how translating it as “manufacturing” doesn’t quite convey the message? Also, can you see why it is not translated to the above phrase each time?! It would certainly spoil the natural rhythm of the sentence. Working at this from the other direction, “lean” on an English page may be written in katakana (a foreign word) on a Japanese page, but the term does not inspire images of excellence through eliminating waste (like it does to us now in English). In fact, most professionals in Japan are mistaking what the Western definition of lean is. They instead consider that lean refers somehow to becoming very thin, starving and then falling over – bankruptcy! So let’s get this right. “Lean” is a concept coined in the West to package up concepts based on the Toyota production system. But, if Japan is not using the term “lean” in the same way it is used in English, what terms and concepts do they have that define “lean” in Japanese? Do you really think Honda describes it as the Toyota Production System? Ben Sparrow is Director and Consultant with lean manufacturing consulting firm Shinka Management. Ben leads kaizen and lean six sigma training courses in Australia and Japan. Many Australian companies have recently attempted to implement lean programs, but there are limited cases of its successful and ongoing implementation. Companies have never seen a genuinely successful example to benchmark against. Companies overlook the people and culture when implementing lean programs. Companies miss the true essence of lean due to a flood of misinterpreted opinions and lean learning materials in the marketplace. The Lean Japan Tour has been an annual initiative of the Australian Industry Group since 2007. It is a fully arranged opportunity to experience first-hand the world-class application of lean thinking at some of Japan’s key manufacturers. Generous time is allocated for open-topic discussions with managers of these companies, allowing participants to uncover how the Japanese have approached sustained productivity improvement efforts successfully over many years. The tour is led by Shinka Management in association with Japan Management Association Consultants (JMAC), Japan’s oldest management consulting firm. With its clients, JMAC has been developing many of the famous tools of ‘lean thinking’ for almost 70 years. These are not new concepts for JMAC, and the company has accumulated a lot of know-how in the successful application of lean thinking across all departments of companies and industry sectors. Past tours have included visits to companies such as Toyota, Panasonic, Rinnai, Sekisui Heim and Kewpie Mayonnaise. The shop floor tours give a comprehensive operator-level look at the factory operations. The tour will enlighten each participant’s comprehension of lean. They will come to learn the original Japanese thinking behind the concept and its true application across a range of companies today. Shinka Management lean consultants and interpreters will guide them through the concepts and culture behind the manufacturing success story that is Japan. Previous participant companies have come from food, beverage, steel, construction, metal fabrication, lighting, automotive, plastics and other sectors. They all returned reinvigorated and equipped with fresh ideas. Participants gained a better understanding of the application of lean concepts to their organisations, and how Japan, with a similar manufacturing cost structure to Australia, is approaching the challenge of increased competition from the likes of China, India, Thailand and Vietnam. The tour group is immersed into Japanese culture for the week. Past participants have also used the opportunity to research the different marketing of their similar products in stores, understand what the Japanese retail environment looks and feels like, understand the domestic and international competition for their products, and experience the quality levels of product and service that Japanese consumers demand. Whether participants are new to the concept of lean, or they are searching for that next level of achievement, everyone will come home with a better understanding of how lean can be achieved. There is no substitute for taking the opportunity to visit relevant like-manufacturers and learn from their experience. An experienced Senior Consultant from JMAC’s Production Division conducted a presentation focusing on lean implementation in Japan and the direction of manufacturing in Japan. The session invited open discussion and involvement from all participants. Considering the story of lean from a Japanese perspective threw new light on the true motive behind companies applying lean thinking in the first place and some of the critical aspects that generally do not receive much attention in the West. Gifu Body is one of eight suppliers of finished vehicles to the Toyota Group and recognised as a top-quality Toyota supplier. Their major product is the Toyota Hi-Ace vehicle, but they also manufacture emergency vehicles based on the Hi-Ace design, along with automotive components. The tour group visited four separate factories on this visit; the welding/paint/assembly factory, the pressed components factory, the seat track factory, and one small external supplier. Gifu Body has a clever use of space throughout the plant. This has been required over the years due to the expansion of operations within building size limitations. The life of older equipment has been extended considerably through excellent 5S and TPM programs. Highlighted are simple but effective visual management tools, automated guided vehicles (AGV) and specific examples of inexpensive improvement ideas that have had a considerable effect on productivity. A tour of the Motomachi plant, one of the nine Toyota plants in Toyota City, was conducted by Toyota personnel. Facilities are set up inside the plant to give visitors a clear view of the operations and a true feeling of the shop floor atmosphere. Interactive training areas are also available to provide an indication of the extent and emphasis Toyota places on training its people. The tour incorporated content on the two pillars of the Toyota Production System (TPS); Jidoka and Just-In-Time. TPS tools were explained through video and, where possible, actual shop floor examples of the tools at work. Supported by these pillars, TPS aims to offer high quality, short delivery times, and reasonable cost through employee creativity and intense efforts to eliminate waste. It is designed so that machines and people alike stop production when there is equipment failure, or any other irregularity, in order for it to be immediately corrected. Also, it improves productivity without waste by manufacturing and delivering the necessary parts at the necessary time in the necessary quantity. The second half of the Toyota visit took the group to the Toyota Kaikan Museum. The museum, located adjacent to Toyota global headquarters, contains a showcase of Toyota’s philosophy and corporate direction. The Chairman of Rinnai, Mr Susumu Naito, spoke to the tour group directly in English about the DNA of the company that he has built over six decades since taking it over from his father. Rinnai’s mission states “quality is our destiny” epitomizing a corporate obsession with quality. Rinnai keep production of key components in-house at four of their own factories and seven manufacturing affiliates under the Rinnai Group umbrella. The factory manager leading the tour explained that by realizing this high in-house production ratio, they have control over quality and strive for zero-defect status. All employees participate in improvement and TPM efforts. They maintain a multi-product, mixed-flow production system based on actual demand. Also, through their own logistics network, they can realise timely delivery. Kewpie is a major player in the Japanese food sector, manufacturing products including mayonnaise, salad dressing and condiments. About nine per cent of all eggs produced in Japan, or 230,000 tonnes, are transformed into Kewpie products. The company has devoted itself to the challenge of pursuing the full use of eggs without any waste. This shop floor tour gave a detailed story of how Kewpie source and store their eggs, produce and bottle their mayonnaise, and package and ship their product to maximise freshness. There were excellent usages of andon and visual management to control the production process and a TPM program to maximse equipment effectiveness. The Australian Industry Group and Shinka Management will again conduct its annual Lean Japan Tour from 18 – 24 May 2014. All expenses are included in the tour price except airfares and travel insurance. 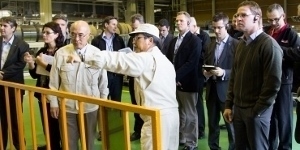 Learn more about the 2014 Lean Japan Tour, open to Australian and New Zealand companies. This article appeared in the Australian Industry Group’s Exporters Guide 2012 – 2013. Ben Sparrow is a Director of Shinka Management Pty Ltd, which works to help Australian Industry increase productivity through Japanese lean management practices and Japan industry study tours. The Lean Japan Tour is open to professionals from across the world. Information on the tour can be viewed in English (Lean Japan Tour) and Turkish (Yalın Japonya Turu). 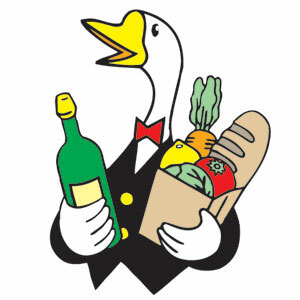 FOODEX JAPAN is the largest food and beverage trade show in Asia. Since 1976, it has been providing the opportunity for exhibitors to promote their products to the expanding Asian markets. In 2012, FOODEX JAPAN had almost 74,000 visitors pass through the gates over four days. Over ten per cent of visitors were from overseas, and exhibitors came from 73 countries and regions. It is held at Makuhari Messe, a facility with a total of 54,000 square meters of exhibition space, located close to Tokyo and Narita Airport. The event presents Australian companies will the opportunity to exhibit to buyers from not only Japan, but from wider Asia, and to access the Japanese distribution system. FOODEX JAPAN attracts the importers critical in introducing products to various retailers, stores and restaurant chefs in Japan. But, as the largest show of its type in Asia, buyers from Korea, Taiwan, China and other growing Asian countries gather. In fact, over 10,000 buyers in total attended in 2012. East-Asian countries tend to follow the Japanese food movement, and if companies and products can make it into the Japanese market, this may also become a gateway to the Asian food market. It is an excellent and effective opportunity for Australian companies to promote their products to expanding Asian markets. The Japanese distribution system has been a challenge for Australian companies to penetrate in years gone by, yet it is the most important factor to the Japanese food industry. However, deregulation, the globalisation of Japanese consumer preferences and initiatives such as FOODEX JAPAN have contributed towards breaking down those barriers to entry for Australian exporters. Foreign companies that have shied away from Japan in the past due to the complex distribution system may well benefit in revisiting the opportunities in Japan. FOODEX JAPAN Secretariat provides a number of programs, free of charge, to expand business opportunities and assist exhibitors to conduct fruitful discussions with buyers. The Importer Club provides import know-how and language support, eliminating the excuse from a buyer that they ‘don’t know how to import’. Exhibitors with Japanese buyers at their booth interested in their products can make effective use of this support service to assist the buyer with the importing procedure, no matter the volume of trade. The Export Wine! One Pallet! program supports that don’t have an importer in Japan to meet Japanese importers. It is set up to increase business negotiations between wine exhibitors and buyers from the food service industry, such as individually run restaurants and izakaya (Japanese-style pubs) that have little contact with overseas wineries, have a lack of importing experience and only require a small order size. Overseas wines not yet available in the Japanese market are showcased and Japanese buyers can visit and taste wine with the advice of Japanese wine professionals on site. The Product Search Service arranges meetings between you and the decision-making buyers from Japan’s large retailers and distributors. Surveys of interested products are conducted in advance with Japanese buyers and importers. Along with pre-appointed meetings, buyers and importers can also visit the booth of the exhibitor for more information if a product meets their need. At FOODEX JAPAN 2012, more than 1500 business-match meetings were conducted with AEON, CGC, Saizeriya, Sundi, TFK, Tokyu Store, and more. Buyers and exhibitors discussed the possibility of sending their products to Japan. FOODEX JAPAN TODAY is a section on the FOODEX JAPAN website that is updated monthly with the latest food trends and products in Japan. Even if you do not plan to participate in the next event, this is a useful source of information for Australian companies. Interviews with decision-making personnel from distributors, importers and restaurants are also uploaded each month so that companies can understand what kinds of overseas products are generating interest, and what kind of information is needed for these buyers and the market. Exhibition Period: 4-7 March 2014. To learn more about how Australian exporters can take part in FOODEX JAPAN contact Shinka Management or visit www.jma.or.jp/foodex. The application deadline for the FOODEX JAPAN 2014 food expo is 1 November 2013. Ben Sparrow is a Director of Shinka Management Pty Ltd, which works in association with Japan Management Association Consultants (JMAC) to help Australian Industry increase productivity through Japanese lean consulting, lean six-sigma training and Japan lean study tours.